"Gagnoa, Cote D'Ivoire | December 15, 2015 A young teen holds a open cocoa melon, revealing its fleshy seeds. Eventually the "meat" of the fruit is discarded and the seeds set out to dry. These dry seeds become the basic ingredient for chocolate. Chocolate production has been plagued by the use of child labor with many companies unable or unwilling to halt the practice. 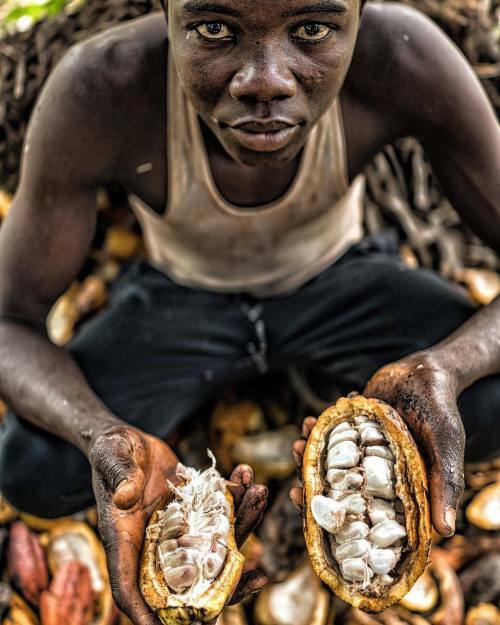 #photojournalism #documentary #reportage #childlabor #chocolate #cotedivoire #cocoa" By benlowy on Instagram.